What is treatment for this hen... she suffers from something like black heads above the eye... local people are saying these absorb blood, and day by day the hen will loose weight, get weak, then death. Thank you for sending the photos. I've never seen something like this on a chicken before. Her eyes look clear and bright and other tissue looks alright, from what I can see, except the area just above the eyes. The first thing I wonder is how these kind of wounds would happen to a chicken, They look like they are caused by an irritation. My first guess would be that she possibly scratched herself with her feet, maybe due to mosquito bites. Do you have mosquitoes in your area? You mention "black heads". My understanding of black heads is that they are just clogged pours in the skin clogged with dead skin cells, oil or dirt - maybe all three. I've never seen a black head on a chicken though. I don't see any way that black heads or the condition I'm seeing could lead to death, unless this is a common symptom of some disease in your area. I don't like to give birds oral antibiotics unless absolutely necessary. Their digestive systems are delicate and antibiotics can throw off the balance of good bacteria. For what I see in your photos, all I would recommend is an antibiotic salve. If you can get one made for eyes that would be best, but a generic triple antibiotic in petroleum base will work. I would apply it daily and watch that these wounds are healing. Since you mentioned "black heads", I'm wondering if you attempted to remove them, and that's what caused these wounds? If so, I wouldn't recommend doing that again. Do you have other chickens? Do any of them have this same kind of problem? 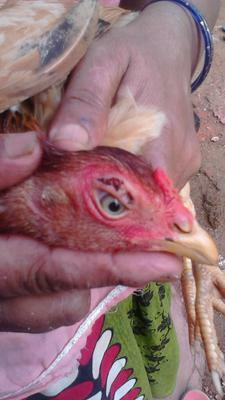 Have you seen this pattern of eye problem on other chickens in your area? If you do have mosquitoes in your area, I would suggest that you keep your chickens inside at night, and that the windows have screen on them to keep mosquitoes out. Chickens generally go into a deep sleep at night and are helpless in the dark. They are easy prey for mosquitoes, which would be attracted to the head area, since there are no feathers. The skin around the eyes is the thinnest and softest. Hopefully your neighbor's predictions will not come true. I can't see anything that looks like black heads in your photos. As long as these wounds don't get infected, and the chicken is eating, drinking, and active, I see no reason that these minor flesh wounds would lead to death.